This week over 50 North East farmers attended the first George F. White Farming Forum in Association with Newcastle University at Kirkley Hall, Northumberland. The innovative partnership between the private and academic sectors gave farmers full access to the very latest thinking on maximizing livestock performance. 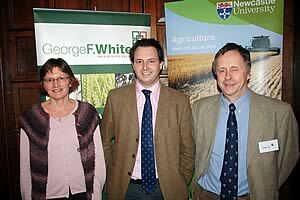 Gillian Butler, Newcastle University, Louis Fell, George F.White and Michael Cain Newcastle University at their first Farming Forum. Keynote Speaker, Mrs Gillian Butler, Lecturer in Animal Science at Newcastle University presented her findings on strategic parasite control. Worm burden has a significant effect on growth but after 30 years of relying on the same families of wormers, parasites have developed resistance. Consequently, wormers are less effective. Farmers need to take care that the timing, dose rate and administration of wormers is done in a planned and strategic manner. Farmers need to prioritise and protect vulnerable young lambs and target a whole farm reduction in the level of worms found on the pasture. The use of wormers should also be used in conjunction with other measures such as grazing management, nutrition, Faecal Egg Counts (FEC), breeding for selective resistance and managed exposure of young sheep to worms to facilitate a gradual build up of tolerance. Nutrition and particularly protein is extremely important in ewes research into alternative forages has found the presence of clover, chicory and sainfoin in the sward and protein supplementation is beneficial to the ewes ability to cope with worm challenge, especially during periods of high stress namely pregnancy and lactation. Attendees were extremely interested in the session where Simon Hunt from Novartis introduced its new generation of wormer ZOLVIX- MONEPANTEL- 4AD (Orange Drench). It is 99.9% effective against all known worm types and has an extremely high safety specification utilising an enzyme only found in the target species. It’s usage is recommended as an isolation dose for all sheep coming onto the farm, as a mid season dose for lambs once they have been treated with conventional wormers and on farms where there is already a triple resistant worm strain. Speaker Andrew Clark from Agri-Lloyd then spoke on the necessity for trace elements for growth and breeding performance. Supplementation is required because forage is naturally short in key nutrients and minerals particularly selenium, cobalt and phosphorous. In addition heavy metals such at Molybdenum can have a detrimental effect on the availability of other key trace elements. Formulation can be complicated but mineral supplements have a huge impact, currently up to 65% of UK livestock are performing at a lower level than they could be due to trace element deficiencies. Louis Fell, Partner at George F. White finished the evening by looking at business accounts and how they can also be used as a tool for maximising performance. Understanding Farm Accounts and Cashflows is crucial for farmers to calculating the real cost of rearing their livestock. Farmers should make a full and comprehensive assessment of the resources available to their farm business, including land, property, buildings, water, capital and length of tenancy. This will allow them to identify any constraints and formulate plans for the future. Farm budgeting is a good place to begin and farmers should take care not to be to optimistic with the figures and ensure they allow some slack with the associated costs of production and allow adequate cover for the costs of living. By stripping out the cost of living and any none farming income such as subsidy farmers can then begin to look at individual enterprise performance. Farmers need to establish the enterprise output (number of animals sold and value) and the cost of production (Replacements, concentrates/forage, vet and med, sundry costs). By allocating this on a headage basis it will allow them to assess where money is being made or lost and show where savings might be possible. Or where improvements to performance are necessary to justify the costs incurred. Ultimately they will be left with the question is all the effort worth the return.